Not to be confused with Army of the Republic of Bosnia and Herzegovina. The Armed Forces of Bosnia and Herzegovina (OSBiH; Serbo-Croat-Bosnian: Oružane snage Bosne i Hercegovine/Оружане снаге Босне и Херцеговине, ОСБИХ) is the official military force of Bosnia and Herzegovina. The BiH Armed forces were officially unified in 2005 and are composed of two founding armies: the Bosniak-Croat Army of the Federation of Bosnia and Herzegovina and the Bosnian Serbs' Army of Republika Srpska (VRS). The Ministry of Defense of Bosnia and Herzegovina, founded in 2004, is in charge of the Armed Forces of Bosnia and Herzegovina. In accordance with the BiH Constitution (Article 5.5a), BiH Law of defense and BiH Law of service the supreme civilian commander of the Armed Forces Bosnia and Herzegovina is the collective Presidency of Bosnia and Herzegovina. The collective Presidency directs the Ministry of defense BiH and the Armed Forces. Former Bosnia and Herzegovina ministers of defense include H.E. Nikola Radovanović, H.E. Selmo Cikotić and H.E. Muhamed Ibrahimović. The current Minister of defense BiH is H.E. Marina Pendeš. Former Chiefs of Joint Staff AF BiH include LGEN Sifet Podžić, Lieutenant General Miladin Milojčić and Lieutenant General Anto Jeleč. The current BiH Chief of Joint Staff is Major General Senad Mašović. Conscription was completely abolished in Bosnia and Herzegovina effective on and from 1 January 2006. The Bosnia and Herzegovina Defence Law addresses the following areas: the Military of Bosnia and Herzegovina, Government Institutions, Entity Jurisdictions and Structure, Budget and Financing, Composition of Armed Forces of Bosnia and Herzegovina, War Declaration, natural disasters, conflict of interests and professionalism, Oath to Bosnia-Herzegovina, flags, anthem and military insignia, and transitional and end orders. The AFBiH was formed from three armies of the Bosnian War period: the Bosnian (dominantly Bosniak with numbers of Serbs and Croats) Army of the Republic of Bosnia and Herzegovina, the Bosnian Serb Army of Republika Srpska, and the Croat Defence Council. 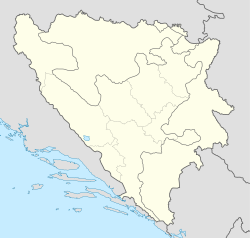 The Army of the Republic of Bosnia And Herzegovina was created on 15 April 1992 during the early days of the Bosnian War. Before the ARBiH was formally created, there existed Territorial Defence, an official military force of Republic of Bosnia and Herzegovina, and a number of paramilitary groups such as the Green Berets, Patriotic League, and civil defense groups, as well as many criminal gangs and collections of police and military professionals. The army was formed under poor circumstances, with a very low number of tanks, APCs and no military aviation assets. The army was divided into Corps, each Corp was stationed in a territory. The first commander was Sefer Halilović. The Army of Republika Srpska was created on 12 May 1992. Before the VRS was formally created, there were a number of paramilitary groups such as the Srpska Dobrovoljačka Garda, Beli Orlovi, as well as some Russian, Greek and other volunteers. The army was equipped with ex-JNA inventory. It had about 200 tanks, mostly T-55s and 85 M-84s, and 150 APCs with several heavy artillery pieces. The Air Defense of VRS has shot down several aircraft, like F-16, Mirage 2000, F-18 and one Croatian Air Force MiG-21. The VRS received support from the Yugoslav Army and FRY. The Croatian Defence Council was the main military formation of the Croatian Republic of Herzeg-Bosnia during the Bosnian War. It was first organized military force to with the aim to control the Croat populated areas, created on 8 April 1992. They ranged from men armed with shotguns assigned to village defense tasks to organized, uniformed, and well-equipped brigade-sized formations that nevertheless employed part-time soldiers. As time went on, the HVO forces became increasingly better organized and more "professional", but it was not until early 1994, that the HVO began to form the so-called guards brigades, mobile units manned by full-time professional soldiers. In 1995–96, a NATO-led international peacekeeping force (IFOR) of 60,000 troops served in Bosnia and Herzegovina, beginning on December 21, 1995 to implement and monitor the military aspects of the Dayton Peace Agreement. IFOR was succeeded by a smaller, NATO-led Stabilization Force or SFOR. The number of SFOR troops was reduced first to 12,000 and then to 7,000. SFOR was in turn succeeded by an even smaller, European Union-led European Union Force, EUFOR Althea. As of 2004[update], EUFOR Althea numbered around 7,000 troops. The program to train and equip the Bosnian Federation Army after the signing of the Dayton peace agreement in 1995 was a key element of the U.S. strategy to bring a stable peace to Bosnia. The Train and Equip Program also calmed the concerns of some Congressmen about committing U.S. troops to peacekeeping duty in Bosnia. Creating a stable and functioning Federation Army that could deter Serb aggression had the prospect of allowing NATO and U.S. troops to withdraw from Bosnia within the original 12-month mandate, which the administration assured Congress was all it would take to stabilize the country. Train and Equip Program Donated Resources to the Army of the Federation of Bosnia and Herzegovina as of January 1997. The program conducted an “international program review” in April 1998 to demonstrate to U.S. partners that it had been well managed and successful and to solicit additional contributions. The event was attended by 20 current and potential donor countries and an air of satisfaction prevailed. The Dayton Peace Agreement left the country with three armies under two commands: the Bosniak and Bosnian Croat armies within the Federation of Bosnia and Herzegovina, facing their recent adversaries the Army of the Republika Srpska. These three forces together had around 419,000 personnel in regulars and reserves. This force size and orientation was totally at odds with the international peacemakers' vision. Slow reductions did take place. By 2004, the two warring factions had reduced their forces to 12,000 regulars and 240,000 reserves but had made virtually no progress in integrating the two into one new force, though the basis of a state defence ministry had been put in place via the Standing Committee on Military Matters (SCMM). Conscription for periods of around four months continued, the costs of which were weighing down both entities. The restructuring of the three armies into the Armed Forces of Bosnia and Herzegovina represents part of a wider process of 'thickening' the central state institutions in Bosnia and Herzegovina. In order to mitigate some of the potential controversy around restructuring, the Office of the High Representative (OHR) made use of evidence of malpractice in Republika Srpska military institutions. Firstly, from 2002 onwards, OHR utilised a scandal around the provision of parts and assistance to Iraq in breach of a UN embargo (the so-called Orao affair) to support the cause for bringing governance of the armies under the level of central institutions. Following this, in 2004, the process was accelerated, drawing its justification from new evidence of material and other forms of support flowing from Republika Srpska armed forces to ICTY indictee Ratko Mladić. OHR condemned the ‘systematic connivance of high-ranking members of the RS military’ and noted that measures to tackle such systematic deficiencies were under consideration. This was quickly followed by the expansion of the mandate for a Defence Reform Commission, which ultimately resulted in the consolidation of three armed forces into one, governed at the level of the central state. As the joint AFBiH began to develop, troops began to be sent abroad. Bosnia and Herzegovina deployed a unit of 37 men to destroy munitions and clear mines, in addition to 6 command personnel as part of the Multinational force in Iraq. The unit was first deployed to Fallujah, then Talil Air Base, and is now located at Camp Echo. In December 2006, the Bosnian government formerly extended its mandate through June 2007. Bosnia and Herzegovina is planning to send another 49 soldiers from the 6th Infantry Division to Iraq in August 2008, their mission will be to protect/guard Camp Victory in Baghdad. ISAF Bosnian troops display their national flag. ISAF Bosnian troops line up, awaiting for the general march of the Lt. Anto Jeleč. The Military units are commanded by the Armed Forces of Bosnia and Herzegovina Joint Staff in Sarajevo. There are two major commands under the Joint Staff: Operational Command and Support Command. There are three regiments that are each formed by soldiers from the three ethnic groups of Bosnia and Herzegovina: Bosniaks, Croats and Serbs and trace their roots to the armies that were created during the war in BiH. These regiments have their distinct ethnic insignias and consist of three active battalions each. Headquarters of Regiments have no operational authority. On the basis of the Law on Service in the Armed Forces of Bosnia and Herzegovina, the regimental headquarters have the following tasks: to manage the regimental museum, monitor financial fund Regiment, prepare, investigate and cherish the history of the regiment, the regiment publish newsletters, maintain cultural and historical heritage, give guidance on holding special ceremonies, give guidance on customs, dress and deportment Regiment, conduct officer, NCO and military clubs. Each regiments three battalions divided evenly between the three active brigades of the Army. Within the armed forces, there are a number of services. These include a Technical Service, Air Technology service, Military Police service, Communications service, Sanitary service, a Veterans service, Civilian service, Financial service, Information service, Legal service, Religious service, and a Musical service. Armed Forces of Bosnia and Herzegovina were unified in 2005 and at that time they needed a uniform for the newly founded army. MARPAT was designated as the future camouflage pattern to be used on combat uniforms of the AFBiH. Insignia is found on military hats or berets, on the right and left shoulder on the uniform of all soldiers of the Armed Forces. All, except for generals, wear badges on their hats or berets with either the land force badge or air force badge. Generals wear badges with the coat of arms of Bosnia surrounded with branches and two swords.All soldiers of the armed forces have on their right shoulder a flag of Bosnia and Herzegovina. All members of the three regiments wear their regiment insignia on the left shoulder. There are other insignias, brigades or other institution are worn under the regiment insignia. The name of the soldiers is worn on the left part of the chest while the name "Armed Forces of BiH" is worn on the right part of the chest. A machine gunner of the AFB&H, lays down suppressing fire while on an ambush Situational Training Exercise During Immediate Response 2012. Armed Forces of Bosnia and Herzegovina has 36 Romanian 40-round launchers APR-40. AMX-30S France Main battle tank 50 50 units donated by the UAE in 1997. 36 in service, others in storage for spare parts. M60A3 United States Main battle tank 45 1996, US aid program – training included. T-54/55 Soviet Union Main battle tank 142 T-55,12 T-54 10 of them are second hand from Turkey. ^ a b c d e "MINISTARSTVO ODBRANE I ORUŽANE SNAGE BOSNE I HERCEGOVINE" (PDF). Mod.gov.ba. Retrieved 4 January 2018. ^ "NATO and the Defence Reform Commission: partners for progress". Setimes.com. Retrieved 4 January 2018. ^ a b c d Lamb, Christopher J. (March 2014). Arkin, Sarah; Scudder, Sally (eds.). The Bosnian Train and Equip Program: A Lesson in Interagency Integration of Hard and Soft Power (PDF). Washington, D.C., USA. : National Defense University Press Washington, D.C. This article incorporates text from this source, which is in the public domain. ^ HQ SFOR's Joint Military Affairs and BiH Defence Reform, First published in SFOR Informer#171, June, 2004. ^ Aitchison, Andy (2013). "Governing through Crime Internationally? Bosnia and Herzegovina" (PDF). British Journal of Politics and International Relations. 15 (4): 558. doi:10.1111/j.1467-856X.2012.00521.x. ^ Ashdown, Paddy (2007). Swords and Ploughshares: Bringing Peace to the 21st Century. London: Weidenfeld and Nicolson. pp. 248–250. ISBN 978-0297853039. ^ Ashdown, Paddy (2007). Swords and Ploughshares: Bringing Peace to the 21st Century. London: Weidenfeld and Nicolson. p. 294. ISBN 978-0297853039. ^ "ICTY Failure the Main Obstacle to PfP Membership for a Second Time". Office of the High Representative. Retrieved 18 June 2012. ^ "Decision Extending the Mandate of the Defence Reform Commission". Office of the High Representative. Retrieved 18 June 2002. ^ "Struktura". mod.gov.ba. Retrieved 2018-05-30. ^ a b c d e f g h i j k l m n o p q r s t u v w x y z aa ab ac ad ae af ag ah ai aj ak al am an ao ap aq ar as at au av aw "Bosnia Herzegovina Land Forces military equipment, armament and vehicles Army". Armyrecognition.com. Retrieved 2014-10-15. ^ "Пешадијско наоружање - Пиштољ 9 mm ЦЗ99" [Infantry weapons - 9 mm pistol CZ99]. Serbian Army (in Serbian). Retrieved 5 December 2014. ^ "US donates 44 HMMWV's to Bosnia and Herzegovina - AM General". AM General. Retrieved 2018-03-30. ^ a b c Ioannis Michaletos (2012). "DEFENSE BALANCE IN WESTERN BALKANS". Rieas.gr. Retrieved 2013-10-01. This page was last edited on 21 April 2019, at 04:41 (UTC).